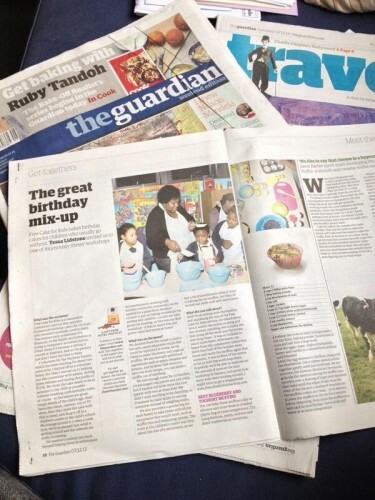 We’ve only gone and got ourselves a double page spread in today’s Guardian! What are you doing still reading this? Why aren’t you rushing out to the shops to get your copy? Naturally we are thrilled and delighted that Eve at the Guardian liked what we do enough to feature us (thank you, Eve) . And it was all the more special that the Guardian’s photographer, Michael, could join us for our first ever community baking workshop with kids (hi Michael! … have you recovered yet?!). And, of course, that the parents and staff at Morningside Children’s Centre were so accommodating. We are funded completely by money we raise or that gets donated to us and run completely by volunteers, so budgets for publicity don’t exactly exist. It is therefore amazing that we’re able to spread the word about our organisation a little further than you, me and the next street post. We are already lucky enough to have a fantastic brigade of bakers who respond to emails calling for cakes to be made faster than the speed of light, but it is important to us that more people who might need our service, or people working with those families, hear about us so that we can grow the work we do. And, even though it may not be the done thing to discuss money, donations are always, ALWAYS appreciated. If you go to our Local Giving site and give a tenner, not only do you make us very happy, but your money gets doubled, which is pretty cool. And the more money we get, the longer we can go on making sure that kids in Hackney who might not otherwise get them DO get cakes on their birthdays. If you are only just hearing about us and have your heart set on becoming a baker then we don’t mind you joining our waiting list if you’re happy to, err, wait. Please be patient with us though. We have already been inundated with contacts since the Guardian went to press – and the twittersphere has gone a little crazy too. We will try to respond to everyone, but we are just five ordinary people with jobs and families and Christmas trees to put up, so we may not be as quick off the mark as you’d hope, but our cogs are definitely turning. If you’re not a Hackney resident but are interested in what we do and would like to be involved, then why not check out the Free Cakes for Kids national site and see if there’s a group near you. If there isn’t, maybe you could set one up? Right, we’re off to read the rest of our copy of the Guardian. We see that “grumpy” Ruby from Great British Bake Off is featured and we’re dying to know what she’s up to now! Thanks for stopping by and being interested in little old us. We promise we’re not going to turn all diva-ish now we’re famous!